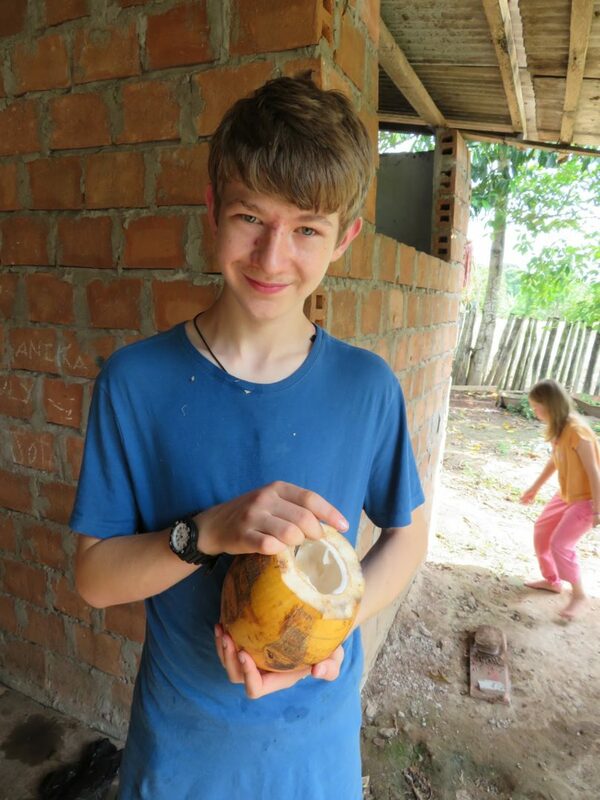 Isaac drinking fresh coconut water. 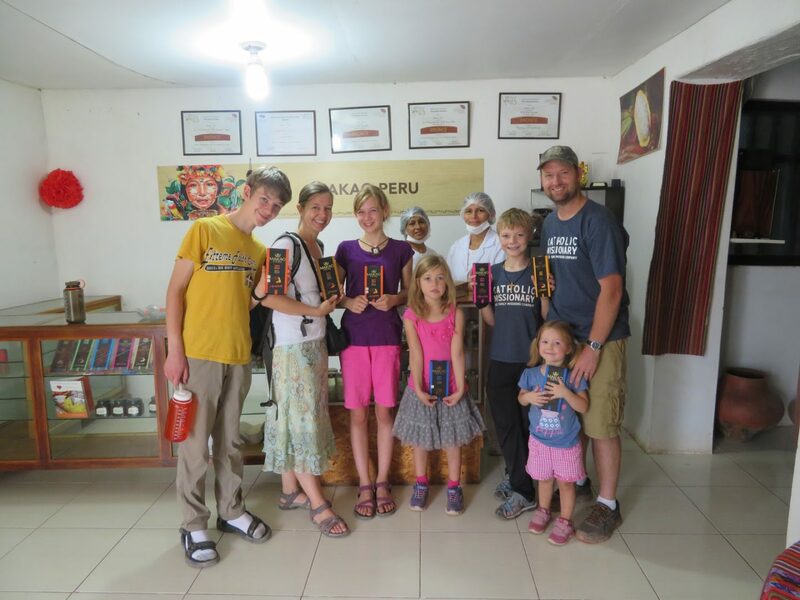 We live in a little pueblo in Peru, about one hour away from the nearest town called Picota, where we go for Mass. 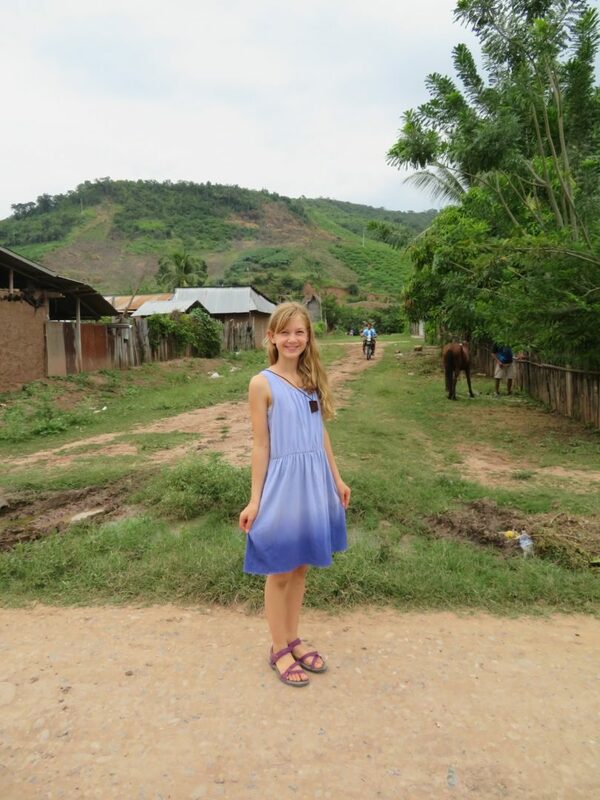 We live about two hours away from Tarapoto, which is a city big enough that it actually has mail service and a grocery store. 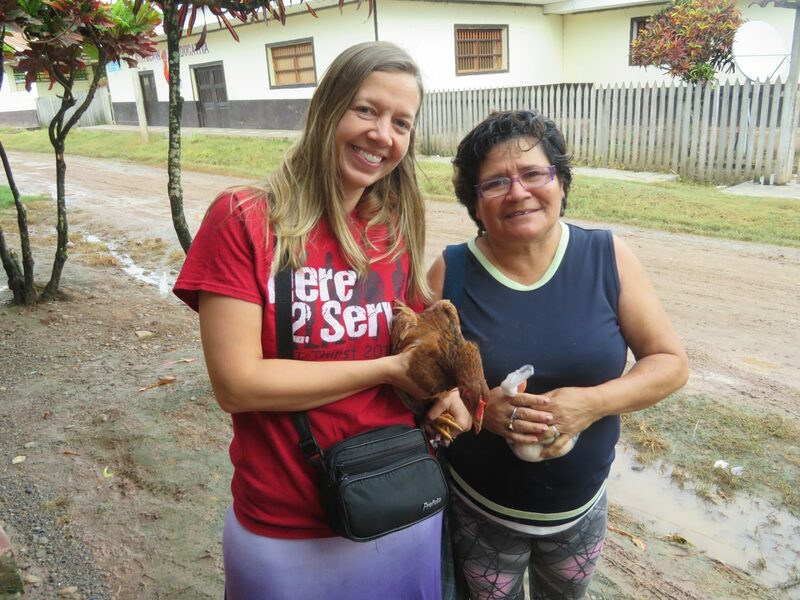 We are living on the outskirts of the dense Amazon jungle and have come as Catholic Missionaries! 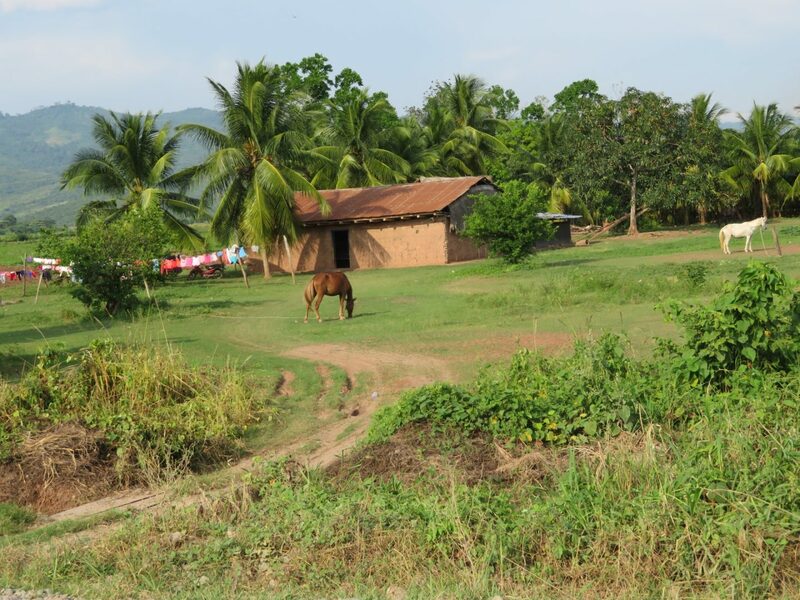 The area out here is very lush and beautiful, but it is also a very poor area. Most of the houses are made out of mud. There are many new, exotic fruits here that you cannot find in the United States. We have a large seven bedroom house, though it is very different from the one’s back home. There is no glass or screens in the windows and there is no ceiling. There is nothing to stop the bugs and bats from flying in and it is always very hot! We also have a large back yard full of banana, coconut, and many other tropical fruit trees. 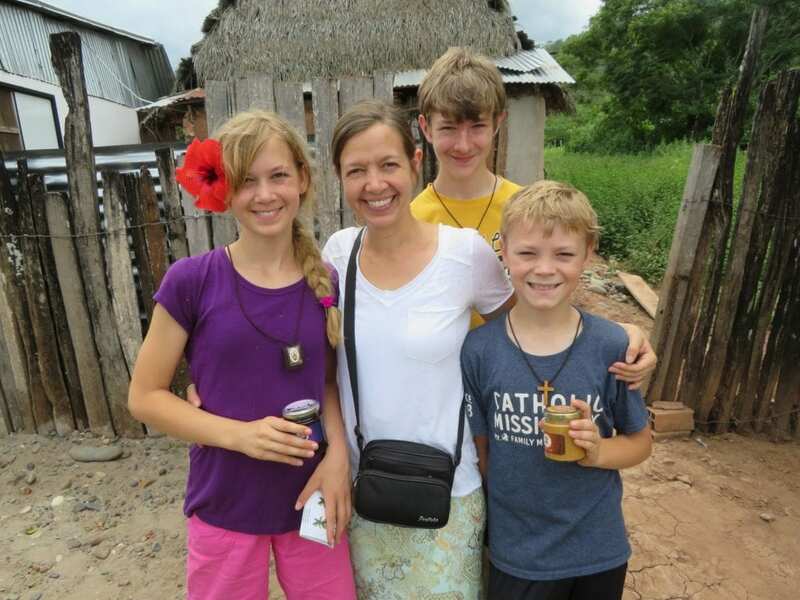 The people here are not very well formed or catechized and there is a great need for missionaries. We have also hired someone here to help cook and clean. She is very thankful for the work. She said that before there would be days she really struggled to feed her family, and now the work is helping her to afford food and school supplies for her children. Oh, and we just got a refrigerator! That made a big difference. Thank you everyone for your prayers and support! We really appreciate it. Things are fairly intense out here bringing Christ to the peoples of the tropical wilderness of Peru. It has been quite an adventure and we have been praying for you too. A beautiful view along the road on the way to our pueblo. 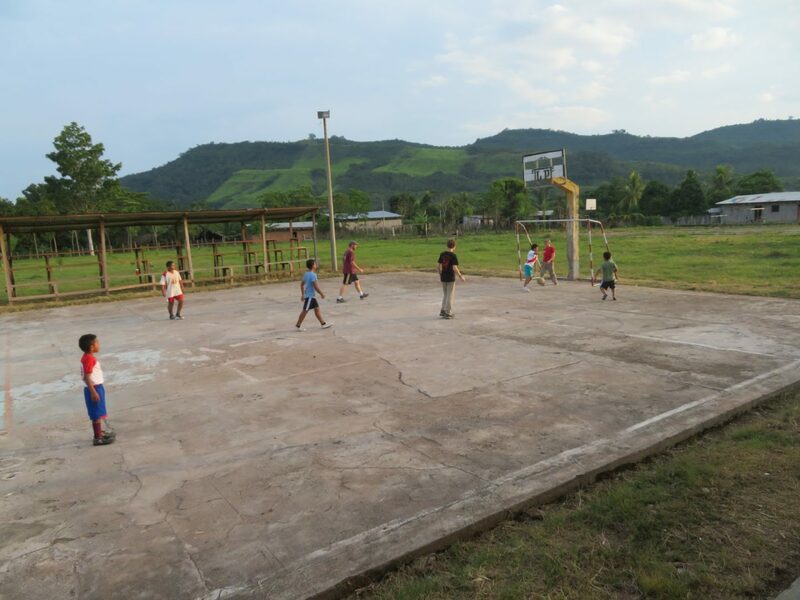 The boys playing futbol with the neighbor kids. 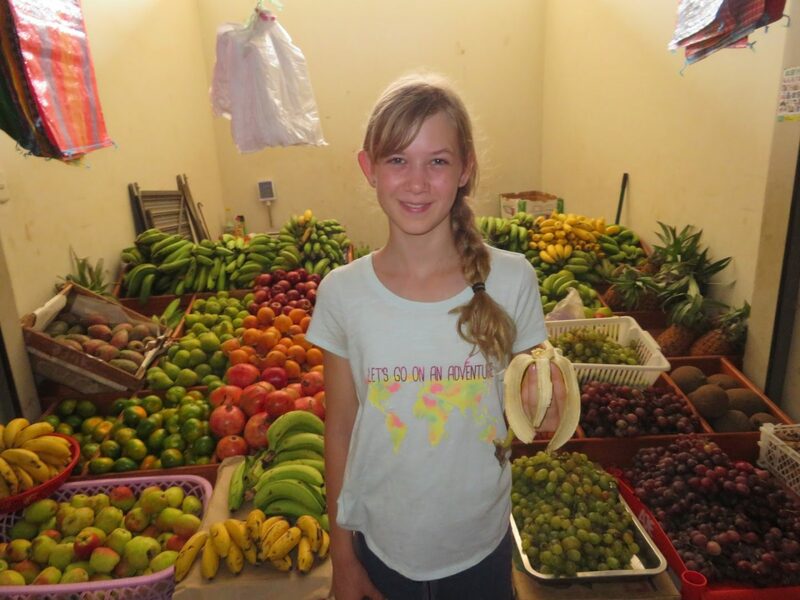 Fresh fruit from the market in Picota. Gemma standing outside of our house in Leoncio Prado. 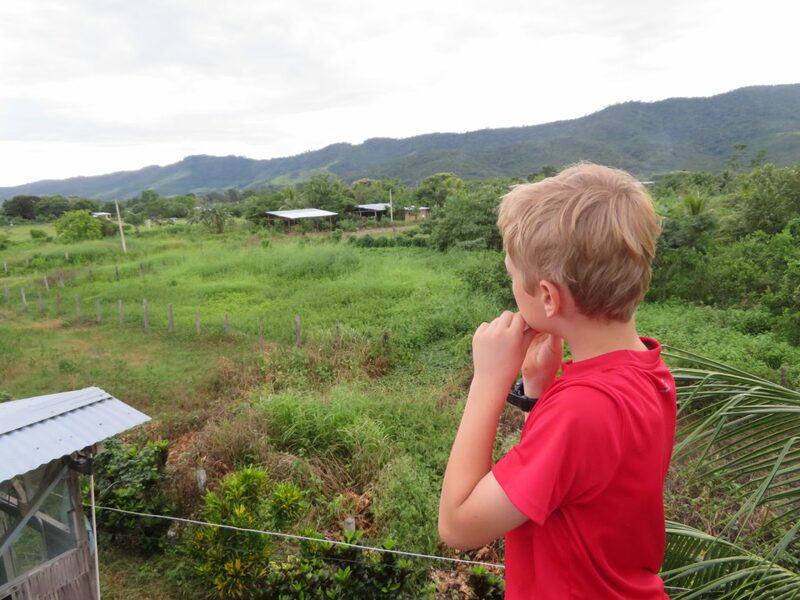 Augustine enjoying the view in Tingo. This is my paragraph about Peru. First, it is REALLY hot🔥 here! I bet you’re thinking, “Lucky!” But I bet if you were here you wouldn’t be thinking, “Lucky!”, you’d be thinking, “I want snow.” Because, right now, I want snow❄. If it did snow in Peru, it would be a really big deal! We have a chicken🐔that loves to hang around in our banana 🍌 forest (35-45 trees🌴). We also have a lemon tree, a coconut tree, and other fruit trees in our backyard. Our house is really dirty, even though we have cleaned it a ton. The floor always has a layer of dirt, the walls are blah, and there are bugs all over. There is a chocolate 🍫, coconut oil, and peanut butter factory about 30 miles (1-1 1/2 hours, because the road is really bumpy) from our house. Today we visited all three! 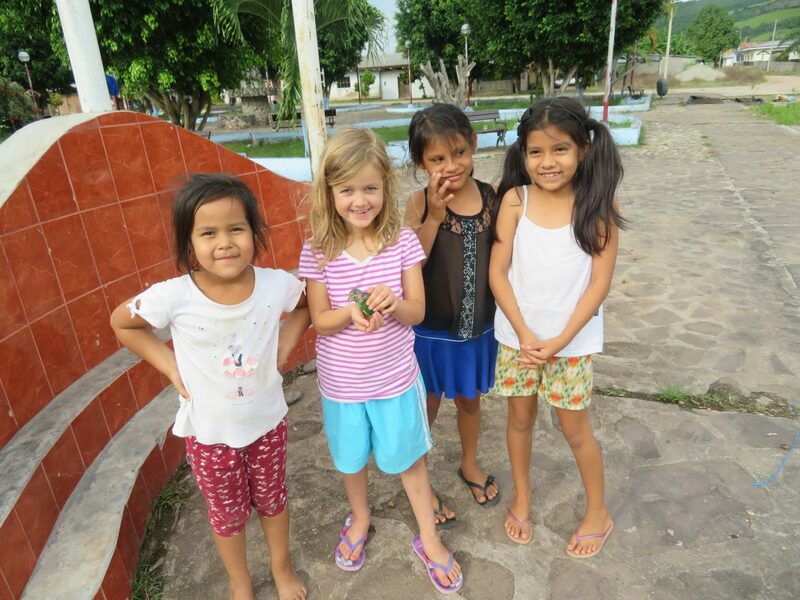 Bridget with her new friends! We have a pet chicken, and we hope to get some more. Our chicken’s name is Josephina, which is a Spanish name. 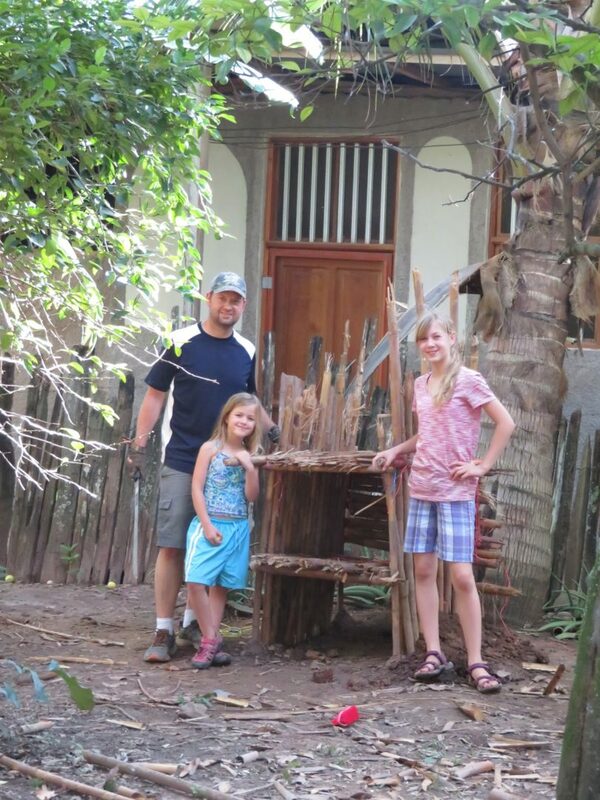 She is living up in a tree in our yard, so we built a little chicken coop for her our of bamboo. Our house has a roof, but no ceiling, so my dad and Crespo are building a ceiling in the bedrooms so the birds, bats, moths, etc. will go away. Crespo is a neighbor from Leoncio Prado which is where we live. There are lots of kids in our neighborhood. They come in our house a lot. When we don’t want them to come in we close our front door. It can be hard to play with them because I can’t understand them. Even so, I am still making friends! Building a little chicken coop for Josephina. 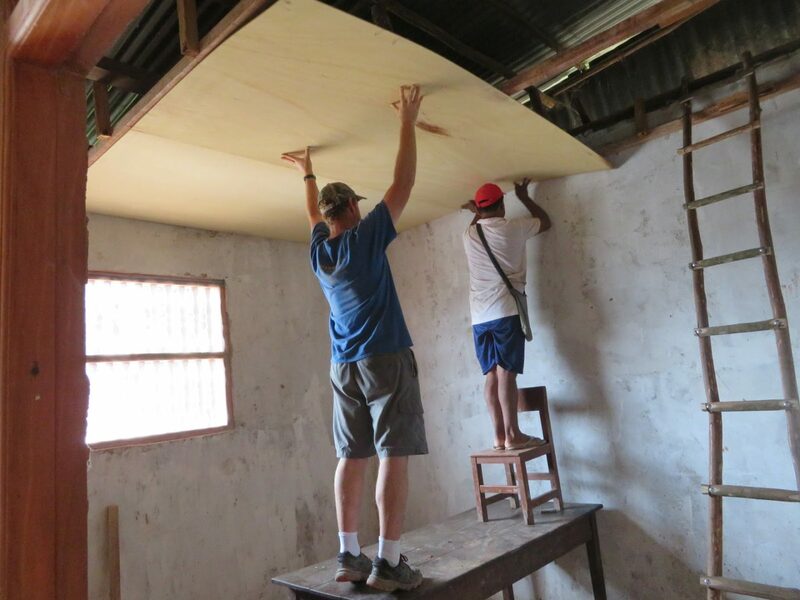 Jason and Crespo putting up a ceiling in one of the bedrooms. Inge and Leila bringing home Josephina.